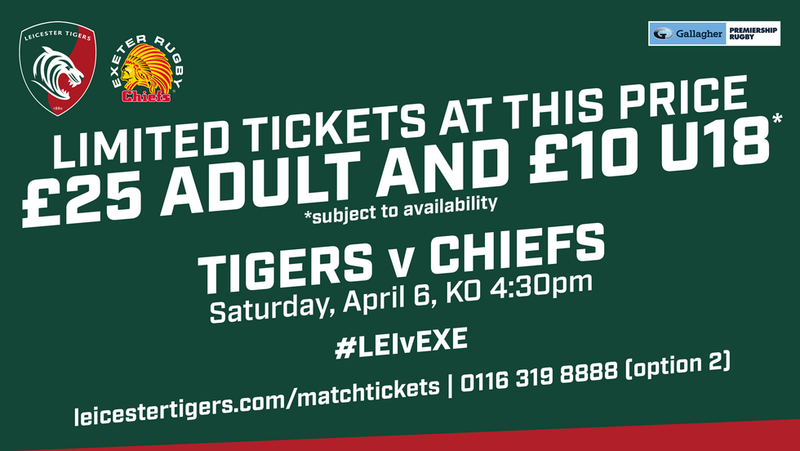 Leicester Tigers supporters have until 5.00pm on Thursday, April 4 to take advantage of the best-priced tickets when Tigers take on Exeter Chiefs this weekend. Tickets are currently priced at £25 for adults and £10 for under-18s/juniors in bronze seated areas and will go up to £35 for adults and £16 under-18s/juniors after 5.00pm. Tigers face Exeter in Round 18 of the Gallagher Premiership on Saturday, April 6, 4.30pm so be sure to act quick to take advantage of our best value prices. Tickets for Tigers final two remaining home games against Bristol Bears (Saturday, April 27, 3.00pm) and Bath Rugby (Saturday, May 18, 4.00pm) are available with our West Country Combine-d offer. Guarantee your place at both games from just £40 adult and £15 junior Terrace and Bronze areas. Click below for all our match ticket offers or contact the Tigers ticket office on 0116 319 8888 (option 2).